My Canon MF4770 multifunction printer could send an receive faxes, but could not print faxes that were received. So I thought, time for a new printer. It's an amazing laser printer that can copy, print and fax, They are usually about $100 when on sale. Canon technical may not be much help unless you fax them a receipt showing you own the canon printer. Some of the Canon multifunction printers are CARP raster scanning printers. It is hard to find Linux drivers for these printers. The MF 4770 works great in Linux Mint 17 and 18. The updated version, the MF216n doe not have a Linux driver. 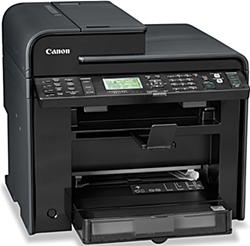 If you can't find a Canon printer driver on Canon USA, try Canon UK. If you bought your printer through Staples or Office Depot in the past couple of years, you my be able to go to their respective web sites, create an online account and download proof of your past purchases. There are a lot of solutions on the Internet for getting into Canon Maintenance mode. Suspect there are different sequences for different Canon printers. Once you get into maintenance mode, the options may be different based up the firmware version. This particular sequence works on a MF4770 with a boot ROM of 1.07. Press Menu, then 2, 8 and Menu again. Most problems can be cleared by by going into COPIER, FUNCTION, CLEAR, ALL. This printer should then reboot. Use the back key to back out of the maintenance menus. Then turn the printer off and back on again. Tried the maintenance fix on my old MF4770. after clearing the copier functions it was able to receive faxes again.